I’m still reading Jessica Jones largely because of momentum. 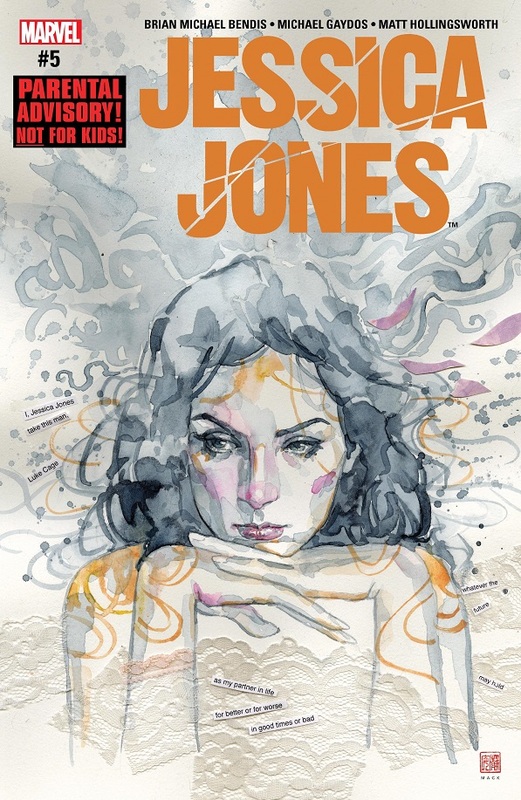 I like Bendis and the Jessica Jones TV show was phenomenal, so I’m still reading her relaunched comic. It’s alright, and I hope it’s going somewhere really good. Jessica Jones sits down to interrogate the man who murdered her client, the man who believes he’s from the Ultimate Universe, transported here after Secret Wars. He explains his theory to Jessica and says he killed his wife because he wanted to see what would happen. Billions upon trillions of lives were snuffed out when Secret Wars destroyed the multiverse, and nothing happened. No one was held accountable and there doesn’t seem to be any negative impact on anybody. He tells her that some of her superhero friends know, but they’re hiding the truth. He’s fine with going to prison for killing his wife because, in the grand, epic scheme of things, nothing matters. The conversation rattles Jessica to the bone, so deeply that she accepts Alison Green’s offer to spy on the superheroes, especially Captain Marvel! Points to Bendis for coming up with a really crazy spin-off from Secret Wars. Bendis’ character proposes a pretty interesting phenomenon here, and I like what he’s getting at. All these big, insane crossover moments and Marvel usually just moves right on. A comic like Jessica Jones is the perfect place to pick up the slack. I like the idea of the scrappy, independent investigator somehow digging into the insanity of Secret Wars (and I always enjoy the Spot cameos). So I like where the story is going, but this is just an issue of the guy laying it all out for Jessica. This has been a very low key, low energy comic. That doesn’t make it bad, but it does dull the excitement a little. I’d be lying if I said Ms. Marvel felt like its old self again. I’m grateful that Wilson gets to tell normal, non-crossover stories again (thank God this book isn’t an IvX tie-in), but a bit of the magic feels like its missing. The spark isn’t the same. Still a good comic, though. Kamala is scared because the Internet Troll knows all her secrets, but she still goes to school because she’s got to maintain her regular lies. Kamala also finds out that the Troll has been exposing the secrets of others, and in fact, his Doc.X virus has infected half the city! Kamala tracks the virus to a construction yard and confronts the ISP holder, a woman named Tess Beckford. They do battle in the construction yard in the rain, with Tess wielding tough super powers. But eventually Ms. Marvel gets the better of her and the cops take her into custody — only for Tess to profess no knowledge of what’s going on. Kamala realizes that the Troll didn’t just hack the computer systems, he also hacked into Tess Beckford! The Troll shows up on Kamala’s phone and reveals that he is the Doc.X virus! Missing spark aside, this was still a fun comic. The villain is new and interesting, and I like that he’s tied into both the modern world and Kamala’s interests personally. A super-villain that exists online? Neat! A super-villain that embodies Internet trolls, both figuratively and literally? Perfect for today’s world! G. Willow Wilson can tell a good story. 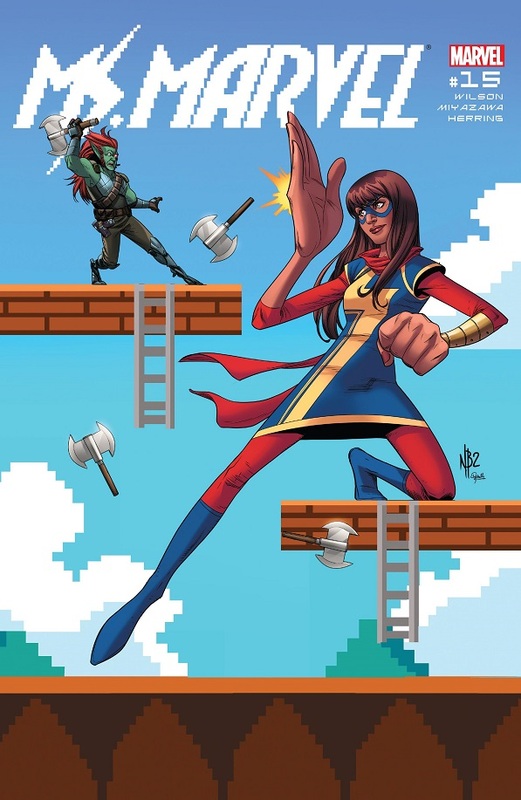 This issue also has a nice blend of superhero action and real life storytelling, which is key to Ms. Marvel‘s appeal. We see her at school with her friends, and we get a short bit with her father and a bowl of popcorn. 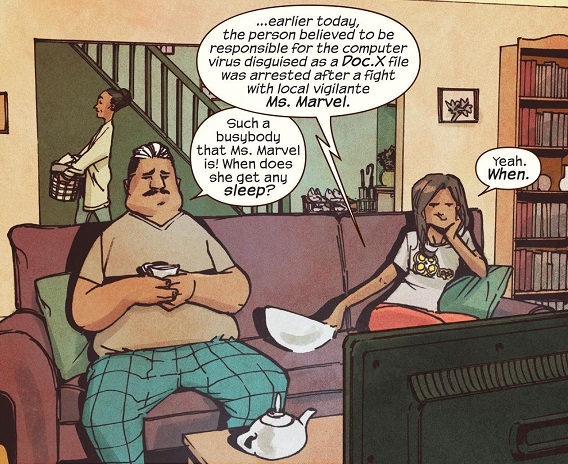 Both are important aspects of Kamala’s character, and I’m grateful we get to see them again. Of course, the superhero action is damn cool too, and Miyazawa is a perfect artist to bring the wild, bendy body of Ms. Marvel to life. A bit of the shine of Kamala Khan has probably worn off since she first debuted, but issues like this one prove that she is still an awesome character at the center of an awesome comic. Have you heard the news? 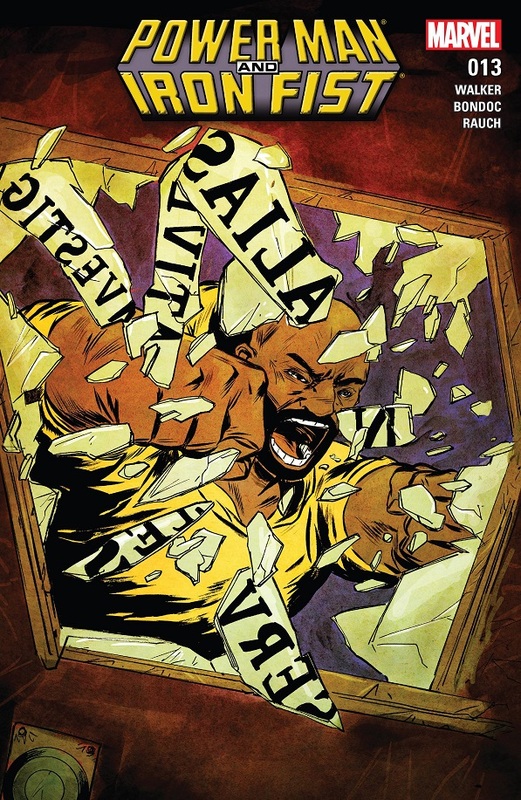 This comic is getting dropped in favor of a Luke Cage solo series by Walker. That’s hugely disappointing, but we live in disappointing times. The gang war is heating up and sides are being drawn. Cockroach Hamilton flees, while Black Mariah doubles down on her partnership with Alex Wilder. The cops bring Luke and Danny in for questioning, but our heroes don’t put up with their garbage, and instead get some inside info from Carlos. While forming their next plan, Danny apologizes to Luke for dragging him back into all of this, but Luke brushes it off without a second thought. They head to Senor Magico’s shop to get some help, but he tells them that Alex already broke in and stole some mystical artifacts! Alex has gained the powers of a mighty demon! Meanwhile, Tombstone seeks the help of Black Talon to combat all this voodoo nonsense. This gang war storyline is going gangbusters for Power Man and Iron Fist, and this issue really ups the conflict and the danger. Personally, I think Walker could stand to show a bit more of the war’s effect on the public, but the gang action is still strong. We haven’t really seen how the war is effecting Harlem, even though characters are calling it the worst gang war Harlem has seen in years. It’s mostly just named characters butting heads with each other. But those butting heads are great to read! I love that Walker puts just as much attention on the villains as he does Luke and Danny. He’s put together a great collection of Harlem-based criminals, and I like seeing them all interact. I like the scene where Luke butts heads with Cottonmouth at Piranha’s funeral, where both men respect the rules of the street while still disliking one another. I like the scene where Luke and Danny get hassled by the cops. I liked the scene where Danny apologized for everything, only for Luke to essentially tell him it doesn’t matter. Power Man and Iron Fist has a great handle on the character dynamics of their gang war, but I wish they’d expand the story a bit more to show the effects on Harlem as a whole. This is the sort of issue that’s going to feed everybody who dislikes the new female Thor. Aaron is so damn good writing the Odinson! 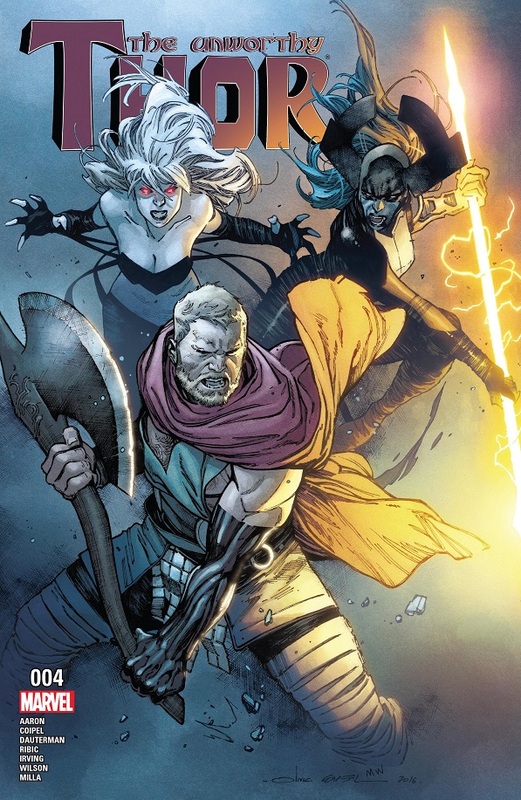 Thor and his forces do battle with the Collector and the Black Order, with everyone trying to reach Ultimate Mjolnir. We see several flashbacks to Thor at various stages of his life contemplating his worthiness to wield Normal Mjolnir. And now, in the heat of battle, he grips the handle of the new hammer and wonders if he’s worthy! This was a truly action-packed issue of this mini-series, which has already been pretty stellar. The fighting is just frantically fun, while still staying true to the all of the characters involved. Always a better fight scene when you know who you’re rooting for. But this issue is even better thanks to the various flashbacks, during which Aaron calls upon the various artists from his Thor run to make them even better. He gives us such great looks into the mind of the God of Thunder over the centuries, and the importance of Mjolnir. I hope Aaron’s complete Thor run goes down as a thing of legend when all is said and done. It’s just that damn good. Eeeeeee! I love the new costume! 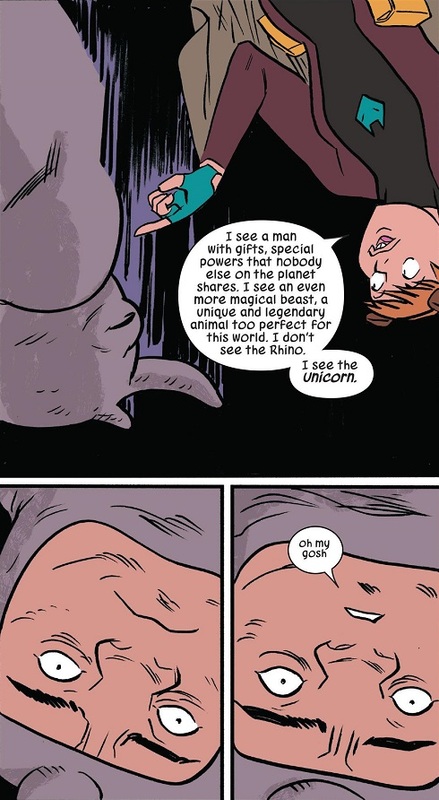 And I love when Unbeatable Squirrel Girl is totally on point! At a guest lecture on campus, Doreen impresses speaker Melissa Morbeck, who invites Doreen for tea later that afternoon. Morbeck reveals that she can speak to all animals and wants to use her wealth to fund Squirrel Girl’s crime-fighting campaign — which includes equipping Doreen with a new costume that comes with flying squirrel accessories. Squirrel Girl goes out with her new flying costume and takes on the Rhino, who she spots robbing a shoe store. They fight at first, but Doreen gets him to talking and convinces Rhino to give up this life of crime and turn into a much nicer Unicorn. But it turns out that Morbeck is secretly evil! And either Doreen will join her evil campaign or die! Looks like we’re in for another fun Squirrel Girl adventure! New costume! New villain! Rhino cameo! What more could people want? This book is continuously hilarious, and North and Henderson are so good at coming up with new things to get excited about and crack jokes about! Guest speaker on campus! More people who can talk to animals! Rhino stealing from a shoe store! Jet pack and wings! While not the funniest issue of Unbeatable Squirrel Girl I’ve seen, this is still a complete package for the series. The story is woven together nicely, all the characters really shine, and the twist in the end that Morbeck is evil is delightfully twisted — let’s just say it involves chicken “Alfredo”. 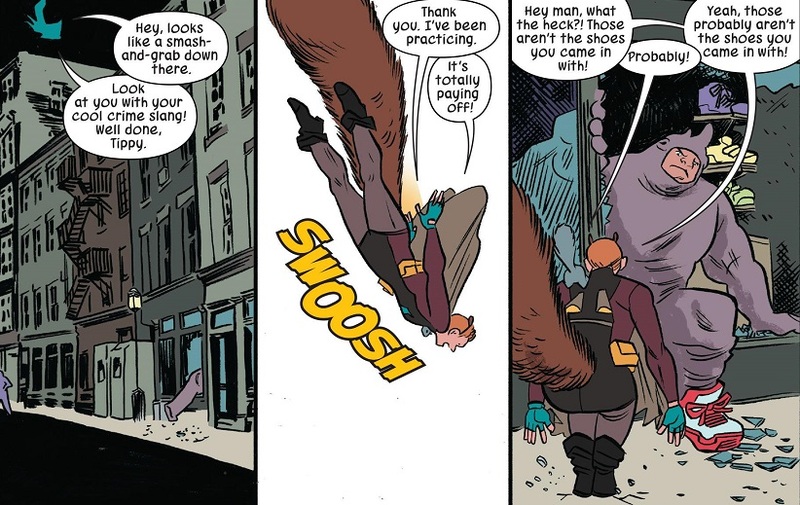 Unbeatable Squirrel Girl is as good as ever, and the new issue promises a lot more fun than just a new, awesome costume! Posted on February 11, 2017, in Comics, Marvel, Reviews and tagged Beta Ray Bill, Iron Fist, Jessica Jones, Kamala Khan, Luke Cage, Ms. Marvel, Power Man, Power Man and Iron Fist, Squirrel Girl, Thor, Unbeatable Squirrel Girl, Unworthy Thor. Bookmark the permalink. 2 Comments. Jessica Jones is fine.Some good meta-commentary. Ms. Marvel is great. Really tense, and a good exploration of privacy in the digital age. And a nice little message about standing together against attempts at shaming. PM&IF is great. The gang war plot takes a quiet moment, but still moves along. Danny talking about his feelings was nice, too. Unworthy Thor has a distinct lack of abs. But at least Thori is still the best puppy. Squirrel Girl is always wonderful. 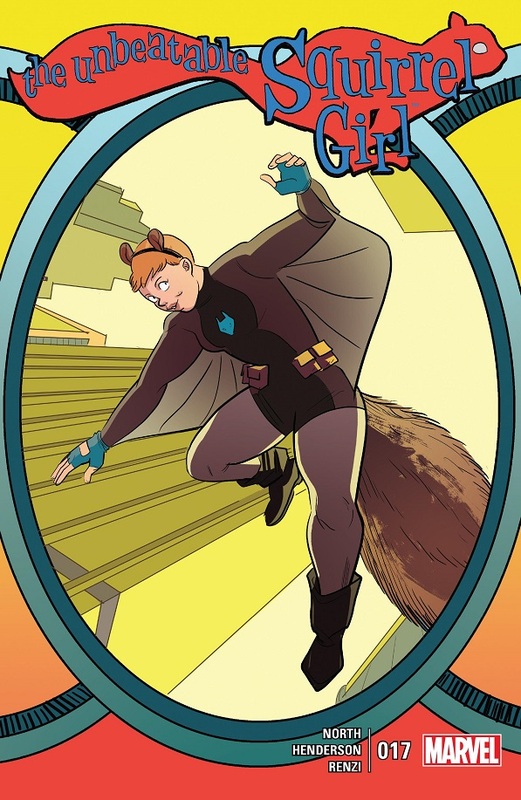 And now: FLYING SQUIRREL GIRL! And Chef Bear! And that post-letters page! Also, some really cool engineering history stuff, because this book is all about teaching. All the teaching probably makes Squirrel Girl both the smartest and the funniest comic on the stands!